Stollen, a German Christmas cake, is rich, sweet, yeast-risen bread loaded with dried fruit. Traditionally, it is shaped as a long loaf with a ridge down the center and tapered at each end, which is said to resemble the swaddled Christ child. Stolen is rich and usually served in thin slices, with butter for breakfast (especially on Christmas morning) or as a coffee cake with afternoon tea or coffee. Read The History of Stollen for more information on this popular Christmas cake. 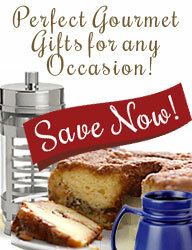 Our best selling stollen in a holiday gift tin has been a holiday favorite for many years. We sell out of this festive stollen in a holiday gift tin early every year so please get your order in early, remember you can buy now and have shipped later as well.The Christmas cake known as Stollen was first baked in Dresden, Germany around 1450. Hand made in Emil Reimann's Backerei in Dresden, Germany and affixed with a seal of quality from the Dresdner's Baker's Guild. this cake is one of the richest of rich German cakes � made with fresh butter, eggs, raisins and candied fruit. A cherished German sweet Christmas holiday cake. Some say the dusting of powdered sugar on the cake is meant to represent the Christ Child in swaddling cloths. This 26.4 ounce stollen serves 10-12 and comes in a decorative tin. German pastries, such as stollen are a bit drier than American style cakes. To make your stollen moister simply toast lightly and spread with soft butter. For a little extra sweetness, sprinkle with powdered sugar. Emil Reimann Original Dresdner Stollen marks the legendary holiday cake served during the Christmas Holiday season. Dating back to the 14th century, to bear the name Dresden, the stollen must be baked in or around Dresden, Germany. Award winning Original Dresdner Stollen are packaged in handsome gift tins.